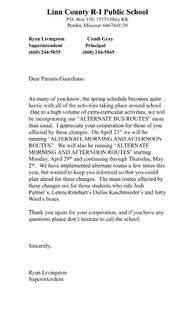 See the letter for explanation of alternate bus routes. The Ledger is available to view online. Contact the school at (660) 244-5035 if you would like to stop receiving the Ledger in the mail. April 2019 March 2019 February 2019 January 2019 December 2018 November 2018 October 2018 August/September 2018 June 2018 May 2018 April 2018 March 2018 February 2018 January 2018 December . . .
Click here to see the Spring Baseball Schedule.